It even lowers your risk of diabetes. Results of a study published in the journal BMJ Open Diabetes Research & Care showed that adding walnuts to the daily diet of those at high risk of developing diabetes lowered cholesterol and improved blood vessel cell wall function while also boosting overall quality of diet. Researchers followed 31 women and 81 men, all varying in age between 25 and 75, and all at a high risk of developing diabetes. Participants were in two groups, with one group following a calorie-controlled diet complete with dietary advice, while the other group followed a diet with no calorie control or advice. Randomly selected participants were chosen from both groups and instructed to include 56g (2 oz) of walnuts in their diet on a daily basis, with the rest of the particpants completely avoiding walnuts for a period of 6 months. At the end of the study participants who had been eating walnuts showed a significant decrease in both ‘bad' and total cholesterol, as well as an improvement in blood vessel cell wall function, key for allowing oxygen and carbon dioxide to pass between the blood and body tissues. However, improved cholesterol levels were also seen in the group avoiding nuts, possibly due to the placebo effect, according to the team. While results across both groups showed no improvement in blood pressure, blood glucose, or ‘good' HDL cholesterol, researchers did conclude that the quality of participants' diets improved overall in the walnut-eating group, with a healthier diet associated with a lower risk of cardiovascular disease. The health benefits from walnuts can be attributed to them being a rich source of essential fatty acids as well as a good source of important vitamins and minerals such as folate and vitamin E. However like other nuts, walnuts are high in calories and experts have cautioned against eating the snack to excess so as not to increase weight. Results of this study also cautioned against excessive walnut consumption, as those that consumed nuts without any calorie control showed a significant increase in body fat. However when consumed more moderately and with calorie restriction, waist circumferance decreased. The team suggested that further studies in more diverse groups of people were in order. Meanwhile a study published last week in the American Journal of Clinical Nutrition, partly funded by The International Tree Nut Council Nutrition Research and Education Foundation, found that tree nuts such as walnuts may help lower the risk of cardiovascular disease. 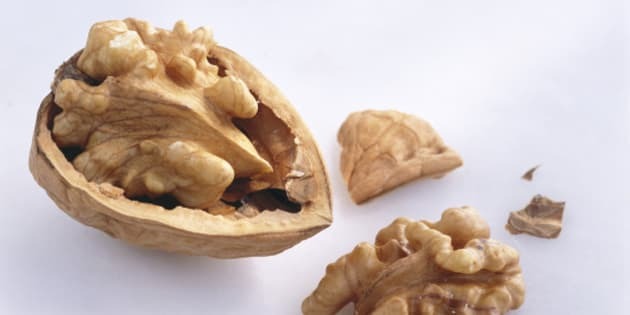 After looking at the results from 61 controlled trials, with walnuts investigated in 21 of the 61 trials, researchers concluded that consuming walnuts and tree nuts in general lowers total cholesterol, a key factor when assessing a person's risk of cardiovascular disease.